Your network contains an Active Directory domain named contoso.com. The domain contains a virtual machine named Server1 that runs Windows Server 2012 R2. Server1 has a dynamically expanding virtual hard disk that is mounted to drive E. You need to ensure that you can enable BitLocker Drive Encryption (BitLocker) on drive E. Which command should you run? Encrypts the drive and turns on BitLocker. The following example illustrates using the -on command to turn on BitLocker for drive C and add a recovery password to the drive. There are two kinds of Administrative Template policy settings: Managed and Unmanaged. 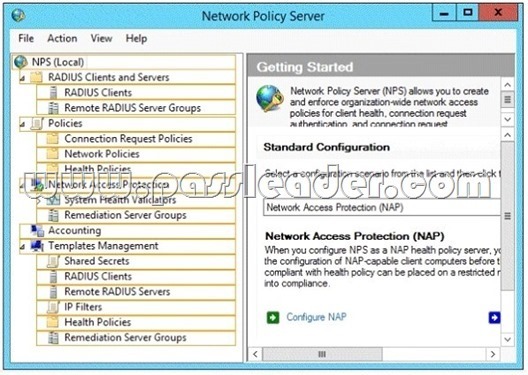 The Group Policy service governs Managed policy settings and removes a policy setting when it is no longer within scope of the user or computer. All desktop computers in contoso.com run Windows 8 and are configured to use BitLocker Drive Encryption (BitLocker) on all local disk drives. You need to deploy the Network Unlock feature. The solution must minimize the number of features and server roles installed on the network. To which server should you deploy the feature? Your network contains an Active Directory domain named contoso.com. You create an organizational unit (OU) named OU1 and a Group Policy object (GPO) named GPO1. You link GPO1 to OU1. You move several file servers that store sensitive company documents to OU1. Each file server contains more than 40 shared folders. You need to audit all of the failed attempts to access the files on the file servers in OU1. The solution must minimize administrative effort. Which two audit policies should you configure in GPO1? To answer, select the appropriate two objects in the answer area. Your network contains an Active Directory domain named contoso.com. All domain controllers run Windows Server 2012 R2. The domain contains 500 client computers that run Windows 8 Enterprise. You implement a Group Policy central store. You have an application named App1. App1 requires that a custom registry setting be deployed to all of the computers. You need to deploy the custom registry setting. The solution must minimize administrator effort. 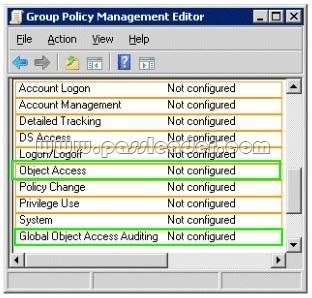 What should you configure in a Group Policy object (GPO)? Group Policy preferences provide the means to simplify deployment and standardize configurations. They add to Group Policy a centralized system for deploying preferences (that is, settings that users can change later). You can also use Group Policy preferences to configure applications that are not Group Policy-aware. By using Group Policy preferences, you can change or delete almost any registry setting, file or folder, shortcut, and more. You are not limited by the contents of Administrative Template files. 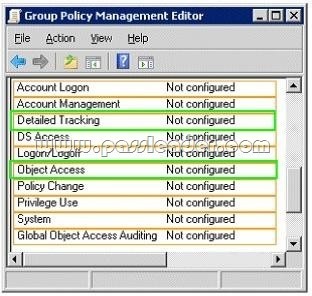 The Group Policy Management Editor (GPME) includes Group Policy preferences. You need to ensure that all of the folders in Folder1 have a 100-MB quota limit. What should you do? You have a server named Server 1. You enable BitLocker Drive Encryption (BitLocker) on Server 1. You need to change the password for the Trusted Platform Module (TPM) chip. What should you run on Server1? The Set-TpmOwnerAuthcmdlet changes the current owner authorization value of the Trusted Platform Module (TPM) to a new value. You can specify the current owner authorization value or specify a file that contains the current owner authorization value. If you do not specify an owner authorization value, the cmdlet attempts to read the value from the registry. Use the ConvertTo-TpmOwnerAuthcmdlet to create an owner authorization value. You can specify a new owner authorization value or specify a file that contains the new value. Exclude targets outside of the client’s site In this method, the referral contains only the targets that are in the same site as the client. These same-site targets are listed in random order. If no same-site targets exist, the client does not receive a referral and cannot access that portion of the namespace. Note 1: Targets that have target priority set to “First among all targets” or “Last among all targets” are still listed in the referral, even if the ordering method is set to Exclude targets outside of the client’s site. Note 2: Set the Ordering Method for Targets in Referrals A referral is an ordered list of targets that a client computer receives from a domain controller or namespace server when the user accesses a namespace root or folder with targets. After the client receives the referral, the client attempts to access the first target in the list. If the target is not available, the client attempts to access the next target. Your network contains an Active Directory domain named contoso.com. The domain contains a server named Server1 that has the Network Policy Server server role installed. The domain contains a server named Server2 that is configured for RADIUS accounting. Server1 is configured as a VPN server and is configured to forward authentication requests to Server2. You need to ensure that only Server2 contains event information about authentication requests from connections to Server1. 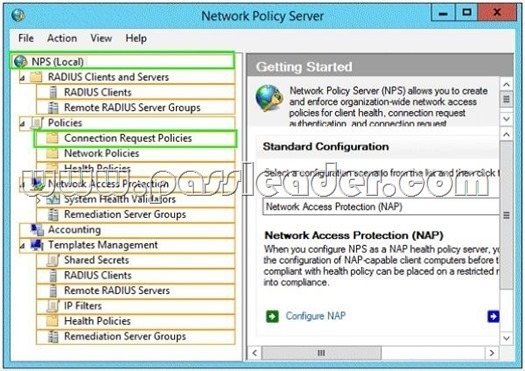 Which two nodes should you configure from the Network Policy Server console? To answer, select the appropriate two nodes in the answer area. You need to ensure that drive D will unlock automatically when Server1 restarts. What command should you run? To answer, select the appropriate options in the answer area. Computer configuration-Administrative templates-Windows components-Event forwarding-Configure the server address, refresh interval, and issue certificate authority of a target subscription manager. Your company has two offices. The offices are located in Montreal and Seattle. The network contains an Active Directory domain named contoso.com. The domain contains servers named Server1 and Server2. Server1 is located in the Seattle office. Server2 is located in the Montreal office. Both servers run Windows Server 2012 R2 and have the Windows Server Update Services (WSUS) server role installed. You need to configure Server2 to download updates that are approved on Server1 only. What cmdlet should you run? To answer, select the appropriate options in the answer area. You have a server named Server1 that runs Windows Server 2012 R2. Server1 has the File Server Resource Manager role service installed. Each time a user receives an access-denied message after attempting to access a folder on Server1, an email notification is sent to a distribution list named DL1. You create a folder named Folder1 on Server1, and then you configure custom NTFS permissions for Folder 1. You need to ensure that when a user receives an access-denied message while attempting to access Folder1, an email notification is sent to a distribution list named DL2. The solution must not prevent DL1 from receiving notifications about other access-denied messages. What should you do? To specify a separate access-denied message for a shared folder by using File Server Resource Manager. — Open File Server Resource Manager. In Server Manager, click Tools, and then click File Server Resource Manager. — Expand File Server Resource Manager (Local), and then click Classification Management. — Right-click Classification Properties, and then click Set Folder Management Properties. You have a WIM file that contains an image of Windows Server 2012 R2. Recently, a technician applied a Microsoft Standalone Update Package (MSU) to the image. You need to remove the MSU package from the image. Which three actions should you perform in sequence? To answer, move the appropriate three actions from the list of actions to the answer area and arrange them in the correct order. Your network contains an Active Directory domain named contoso.com. All domain controllers run Windows Server 2012 R2. A domain controller named DC1 has the ADMX Migrator tool installed. You have a custom Administrative Template file on DC1 named Template1.adm. You need to add a custom registry entry to Template1.adm by using the ADMX Migrator tool. Which action should you run first?